My friends just found Pandy lost and wandering in the streets of Taiwan with an open wound on his right leg. PANDY is friendly to people, medium large size and not neutered yet. He is quite skinny now but the vet said he is a healthy dog. 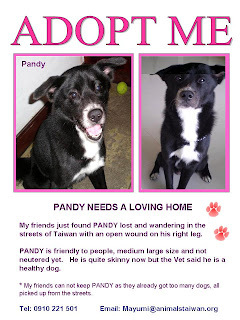 * My friends can not keep PANDY as they already got too many dogs all picked up from the streets.